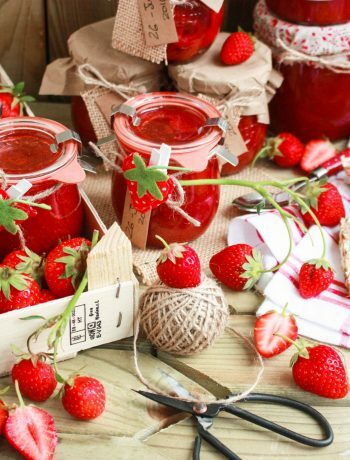 Valentine’s day is coming, what else is better than preparing a delicious and special sweet for your loved one? 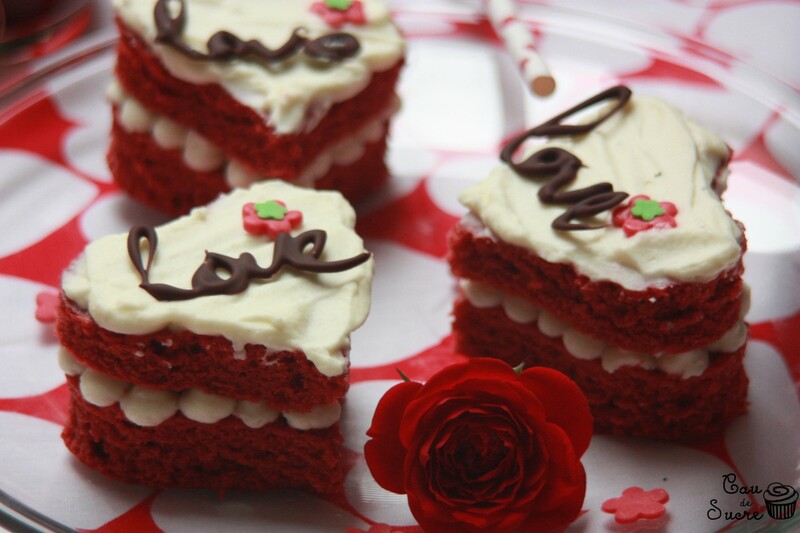 With this red velvet cakes in a heart shape they will be dying for love. Today I am posting another version of the famous red velvet cake. 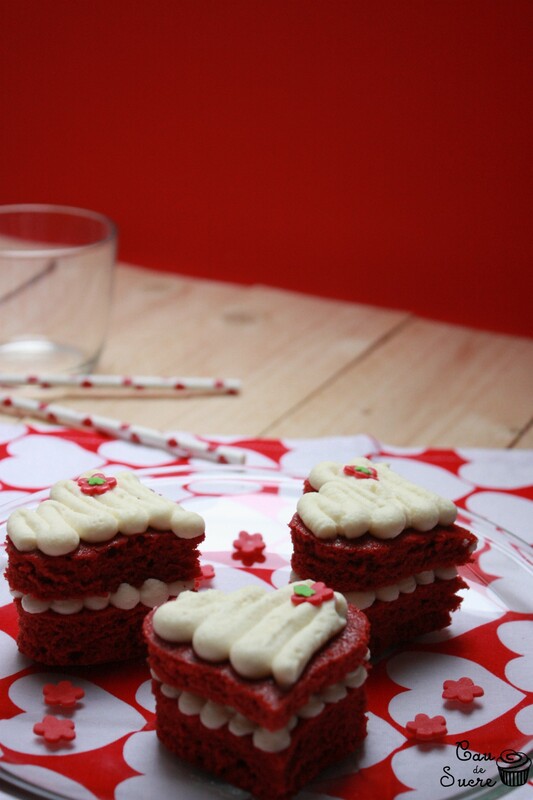 In particular, this recipe is based on the red velvet cake recipe of joyofbaking. 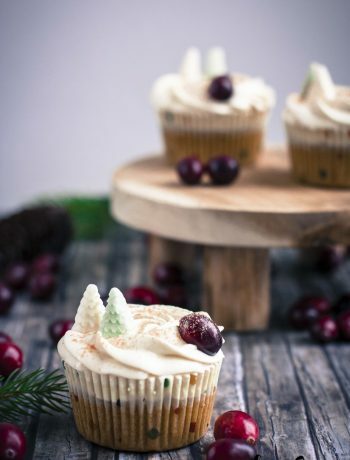 I’ve tried many different recipes and this one is the best one for me, specially the cheese cream version, I could eat it with a shovel, really. So, that’s it, another red velvet cake but in this case what makes it special for Valentine’s day is its shape. 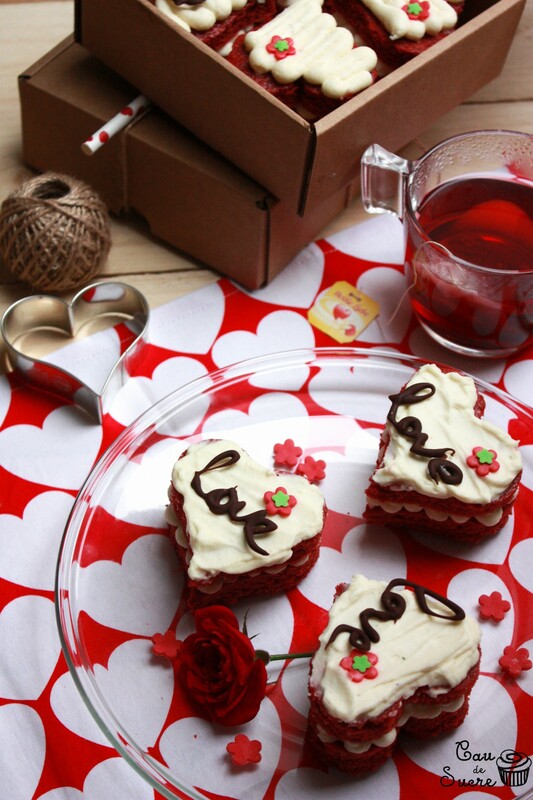 If you finally decide to bake this heart shaped cakes for your beloved, I must say that success is guaranteed. And here it comes confession #3, I don’t celebrate Valentine’s day (just as many others do). From my point of view, everything around this day is pure consumerism. 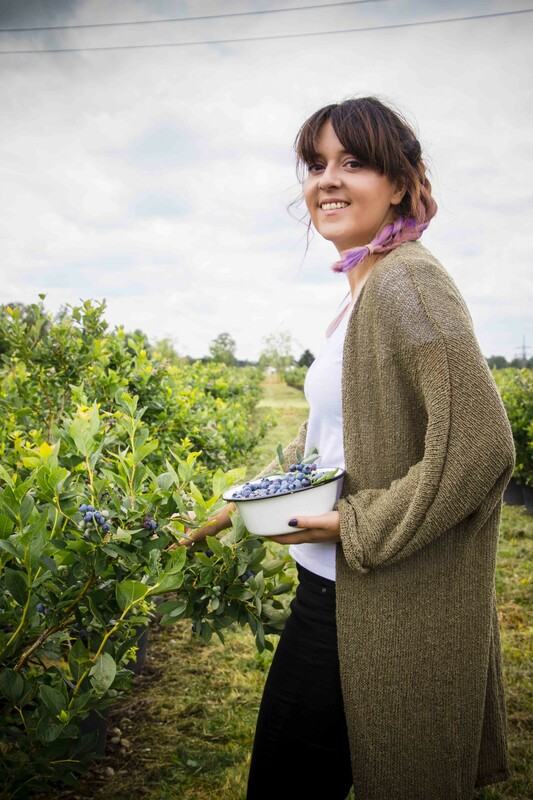 But, it is always good to give your loved one a treat (although it could be any other day) by preparing something with your own hands. For me, those are the best presents. In that case we are not encouraging consumerism and moreover, we are making efforts to show our love better than simply buying a present. And, as I have already said in another post, it is always good to have excuses for baking and… pig out a little bit! So, who is going to blame us for that? 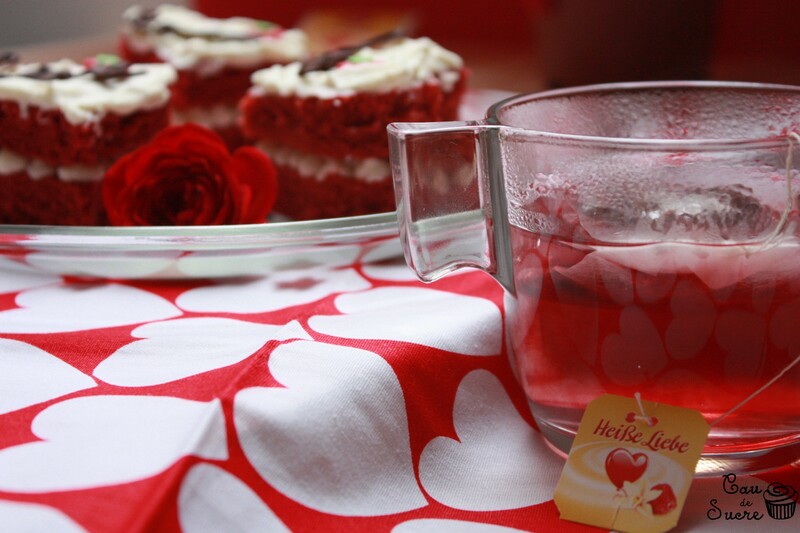 The color of this cake makes it ideal for preparing it as a love icon, this red passion color… I simply love it!. And that is the reason why I enjoy preparing it several times, as a cake, cupcake or any other way. But don’t think the key for being so famous is the color, the flavour is also excellent! It has a sour touch that mixed with the cheese cream flavour makes you be close to heaven. Heart shapes are only a presentation suggestion. You can always use a standard pan and make a normal cake if you don’t want to spend time doing the shapes. 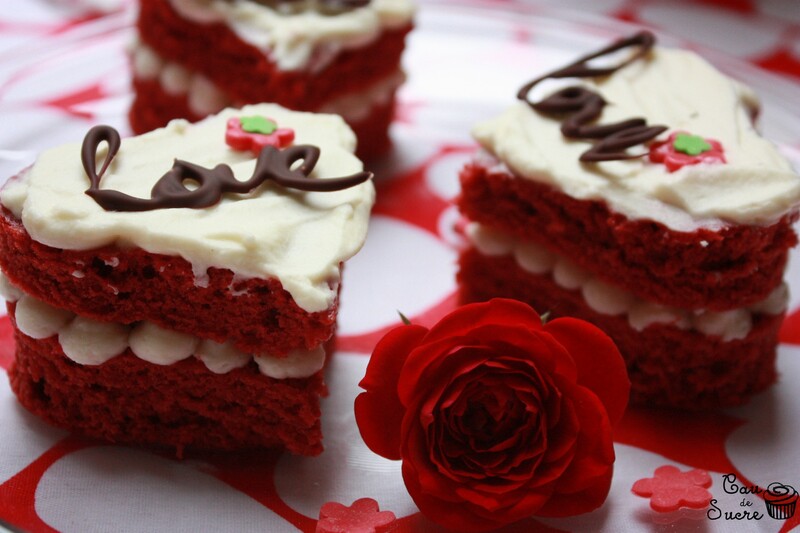 Trust me, with some fancy decoration a red velvet cake will be the perfect Valentine’s gift. Last call for all the lovers in the world! 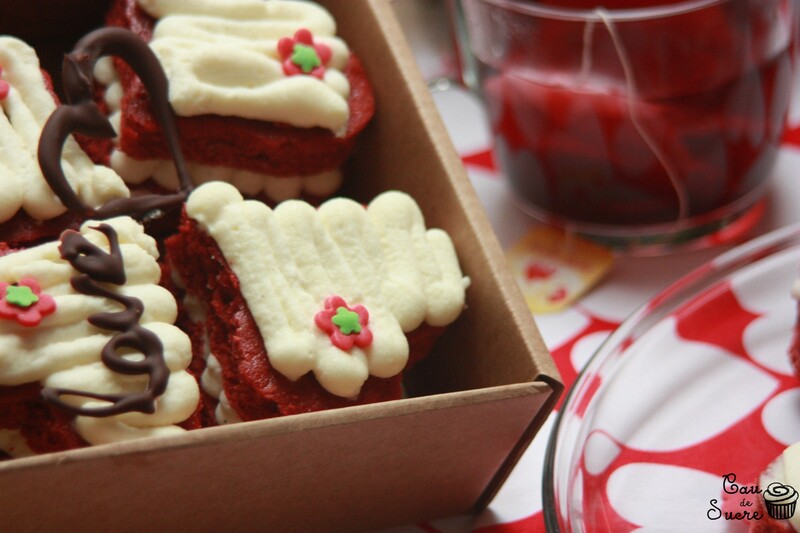 Turn on your ovens and amaze your partners with this SWEET DREAM in technicolor (red velvet). Preheat the oven at 180ºC. Prepare a pan with butter and flour. Beat the eggs in a large bowl, add sugar and butter (previously melted). Mix until combined. Add the buttermilk and mix. Stir in flour, cocoa and baking powder. Add vanilla extract and red colorant. Mix well until combined. In a small cup combine the vinegar and baking soda. Allow the mixture to fizz and then quickly pour into the cake batter. Working quickly, put the batter in the prepared pan and smooth the tops with an offset spatula or the back of a spoon. Bake for about 35 to 40 minutes. 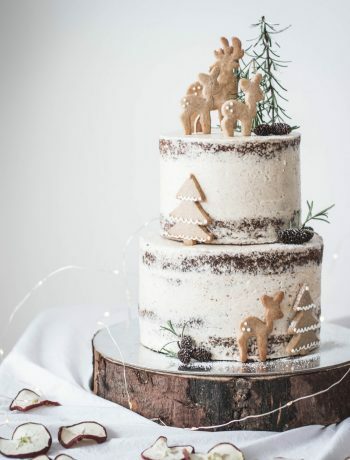 Cool the cake in a wired rack. Once it is cooled, using a heart shaped cookie cuter take pieces of cakes as shown in the pictures. Depending on the cuter size you will have more or less hearts, I got 32. Now prepare the cheese cream, in the bowl of your electric mixer beat the creamy cheese and mascarpone cheese until smooth. Add the vanilla and icing sugar and beat until smooth. Using the whisk attachment, gradually add the heavy cream and whip until the frosting is thick enough to spread (aprox 2 min). Add more sugar or cream as needed to get the right consistency. 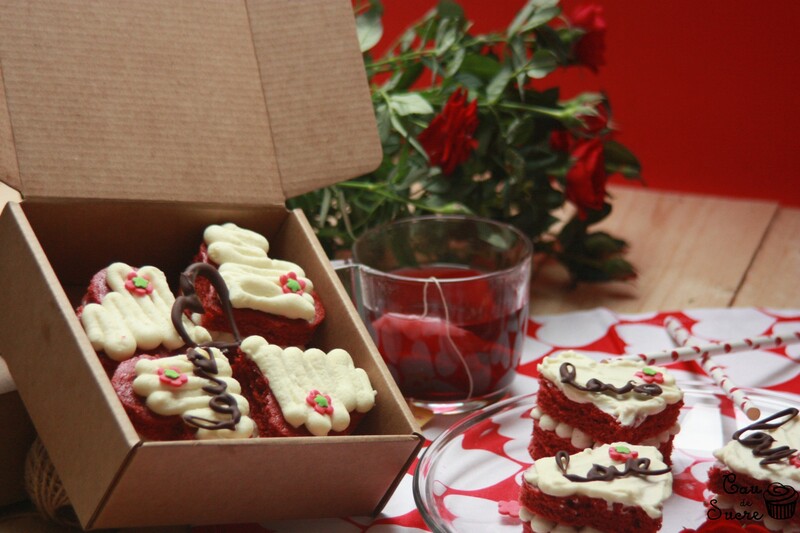 To assemble the cakes, fill a pastry bag with the cream and spread some over the hearts. Cover with another heart and spread more cream on the top part. The red and green flowers, I did them with fondant and a cuter with this shape. Happy Valentine’s day all! And remember that love is something you can show every day, not only the 14th of February. Happy St. Valentine to all! And remember that love must prove it every day, not only on February 14.